Brenda Fitzgerald, a rich doctor who not only wouldn’t pull her hand out of her personal cookie jar of investments and instead plunged it even deeper during her conflicted time in public office, finally has quit the top job at the respected federal agency charged with protecting the nation’s health from disease and other dangers. 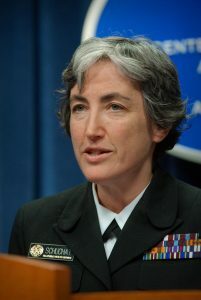 The appointed chief of the Centers for Disease Control and Prevention (shown at top, left) was ethically impaired before and during her half-year term, arguably to the major detriment of her job and the public’s health. She was forced to resign after media disclosures that not only had she slow-walked her divestment in a multi-million-dollar portfolio, owned with her husband, of Big Pharma and other health care enterprises, but, even after she joined the CDC, she was caught buying and selling Big Tobacco stocks. Maybe there are a few Americans who don’t know this, but surely not in the upper reaches of our public health leadership: Smoking is the nation’s leading cause of preventable death, with years of research proving it causes several types of cancer and contributes in huge ways to heart, lung, and other disease. 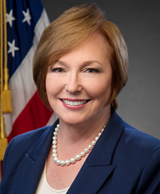 Leading the war on tobacco use, blamed in more than 480,000 American deaths annually, has been a big part of the CDC chief’s job for decades. As she had sought to sell her other holdings, of course, federal ethics officials had informed her that, until she did, she should recuse herself from CDC actions on such critical public health issues as cancer and the war on the opioid drug abuse epidemic that now kills tens of thousands of Americans annually. Lawmakers, especially those with CDC oversight and public health concerns, had expressed growing frustration and even anger with Fitzgerald’s dawdling divestment of holdings that may have amounted to as much as $16 million, as well as how her ethical recusals seemed to make her reluctant to be an energetic campaigner against disease and for Americans’ well-being. Fitzgerald, instead, became not necessarily an inept but inert CDC chief, making few public appearances or statements, often sending deputies instead of appearing herself before Congress. She took more than 100 days before conducting her first all-agency staff meeting. She insisted she had a low-key style. She defended her personal finances, saying they were complex and required her to hold significant parts of her portfolio to avoid losses. She asserted that her financial advisor, who was running her money in blind fashion since she became CDC director, had made the ill-advised Big Tobacco trades. Ethics experts said the dealings and her explanation for them were “baffling” and not credible. An obstetrician-gynecologist, U.S. Air Force major, and onetime Georgia health commissioner, Fitzgerald drew fire years before for her cozy relationships with one of Atlanta’s leading businesses: Coke. She drew fire for letting the soda maker put up $1 million to fund a state children’s health program that emphasized exercise and diet — but little mentioned the nutritional harms of excess sugar consumption, particularly from kids’ guzzling sodas and other sugary drinks. The two-time unsuccessful Georgia congressional candidate, in her years in public life, also became close to Tom Price, an Atlanta area orthopedist. President Trump, of course, tapped Price, who served as a congressman and traded health care stocks with vigor during his time as a lawmaker, to head the sprawling federal Health and Human Services department. Price picked Fitzgerald for her CDC post before he was forced out of office in disgrace for spending tens of thousands of tax dollars to fly on private jets or military transports. Anne Schuchat, an internist and longtime CDC leader who has served as an interim director before (shown at top, right), will step up and run the agency, which the Washington Post says has a budget of $7 billion or so and more than 12,000 employees working across the nation and around the globe on everything from food and water safety to heart disease and cancer to infectious disease outbreak prevention. She confronts some formidable challenges — prospective damage to the agency and its mission that Fitzgerald, 71, proved impotent to avert. The opioid epidemic keeps raging, and despite Trump’s multiple pronouncements, critics say Uncle Sam has failed to muster an effective, national campaign against the abuse of prescription painkillers and the deadly and potent artificial and illegal substances to which they too often lead, including heroin and fentanyl. The country also is in the grips of what’s becoming its worst outbreak of flu in more than a decade, with hundreds of thousands hospitalized and the toll rising, especially among children, 53 of whom have died from the infection or its complications. Meantime, the president and Republicans in Congress have put the CDC, HHS, and other domestic agencies in their budgetary cross-hairs. Tom Frieden, the former CDC chief, assailed a proposed $1 billion slash in agency funding sought by the Administration has part of the 2018 budget. Public health advocates also have criticized plans to eliminate a CDC program that sought to avert domestic health crises by working with nations overseas to curb infections there before they cross the oceans. This has helped tamp down the harms in this country of major infections such as Zika and Ebola, though partisans have howled about American health spending abroad. In my practice, I see not only the harms that patients suffer while seeking medical services but also the critical need for the nation to keep as many of its people as healthy as possible, and out of medical care, with robust public health efforts, notably through agencies like the CDC. Preventive medicine may not appear to save money — and maybe it’s best if we don’t push that myth. But public health measures protect and save lives, too, and that’s inarguable — unless counter-factual partisans would prefer pandemics that kill tens of millions, as occurred with the 1918 flu. The hard-working and effective staff of the Atlanta-based CDC, as well as the rest of us, deserve public health leaders with energy, results, and these spring in part from impeccable personal and professional ethics and integrity. Doctors, who go through decades of education and training to proudly practice healing arts, must display not only formidable book learning but also common sense. It’s great to see lawmaker-physicians forego any sense of privilege or entitlement and leap into action in emergencies, such as occurred in a wreck involving a truck and a train full of GOP members of Congress. Physicians like Price and Fitzgerald — yes, and neurosurgeon Ben Carson with his insider dealings with family members at the Housing and Urban Development department — give their profession a black eye, as well as abusing the public trust.